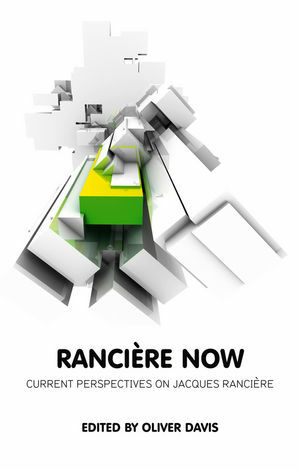 The French philosopher Jacques Rancière is well known across the world for his groundbreaking contributions to aesthetic and political theory and for his radical rethinking of the question of equality. This much-needed new collection situates Rancière's thought in a range of practical and theoretical contexts. These specially commissioned essays cover the complete history of Rancière's work and reflect its interdisciplinary reach. They span his early historical research of the 1960s and '70s, his celebrated critique of pedagogy and his later political theory of dissensus and disagreement, as well as his ongoing analysis of literature and 'the aesthetic regime of art'. Rancière's resistance to psychoanalytic thinking is also explored, as are his most recent publications on film and film theory. Contributors include Tom Conley, Carolyn Steedman, Geneviève Fraisse, Jean-Luc Nancy, Jeremy Lane, and many more. The book also includes a brand new interview with Rancière, reflecting on his intellectual project and developing new lines of thought from his latest major work, Aisthesis. Rancière Now will be essential reading for students and scholars across the humanities and social sciences; it will stimulate and inspire discussion of Rancière’s work for years to come. Oliver Davis is Associate Professor of French Studies and Programme Director of the Centre for Research in Philosophy, Literature and the Arts at the University of Warwick. He is the author of, among other works, the critical introduction Jacques Rancière (Polity, 2010). "This is a significant contribution to the expanding body of work on Rancière. It spans an impressive array of fields, from the social sciences and political theory to feminism, literary analysis and film theory. It also includes important discussions of his most recent publications, as well as a dialogue with Jean-Luc Nancy and an enlightening interview with Rancière himself. All of these features make this collection a very welcome contribution to the burgeoning debate around Rancière’s veritable tour de force in the fields of history, aesthetics and politics." "Oliver Davis has already established himself as a foremost and highly original commentator on the work of Jacques Rancière, bringing unusual insight to its polymorphous achievements in politics and aesthetics. In this collection he sets out a striking polyphony of different voices and approaches, both deeply engaged and critical -- voices that represent a rare level of accomplishment each in their own right. Set against Rancière’s own contributions in interview and conversation, crossing between disciplines and generations, this volume offers a unique match to the importance of its subject." "Jacques Ranciere occupies a position of mainstream marginality in contemporary thought, and the present volume demonstrates both facets of this complex position very well. This volume will appeal both to Ranciere scholars and to those relatively new to his oeuvre."